Commentators, including myself, have been critical of a Federal Reserve policy stance that appears to place uncertain inflation concerns ahead of a very real unemployment problem. Playing devil’s advocate, one can argue that Federal Reserve members are showing remarkable patience in keeping interest rates at rock bottom levels. Even more remarkable is that there is not a greater push to aggressively contract the balance sheet to a more traditional state. Central bankers are simply a very conservative lot, and the Fed is operating at the boundary of what many policymakers can stomach. 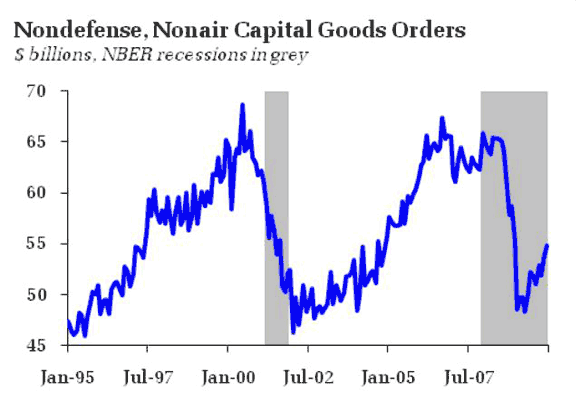 Indeed, recent data must be somewhat disconcerting, with the US economy under the influence of an inventory correction that is having a very real positive impact on the manufacturing sector. And if the January employment report yields a substantial increase in nonfarm payrolls – something not out of the question in the wake of 5.7% growth in the fourth quarter of last year – policymakers may start to think that the balance of risks are turning rapidly toward inflation. Remember, the chief obstacle to tighter policy is the forecast of persistently high unemployment. Data flow that runs contrary to that expectation will raise fears among some policymakers that they are already dangerously behind the curve. Furthermore, highlights of the GDP report included a gain in equipment and software spending in addition to a positive contribution from net exports. Sustained improvement in the latter would be a very significant development, helping the US adjust to a less consumer-dependent economy and providing a basis for additional investment in export oriented and import competing industries. I have, however, been somewhat skeptical that US authorities would actually challenge the fundamentally currency “misalignments” that help perpetuate the still significant trade imbalance. President Obama’s SOTU address, however, and its pledge to pursue export led growth looks to have lit a fire under policymakers. Perhaps the external sector will be a sustained source of growth. That said, talk is cheap – this Administration is not known for policy follow-through. To be sure, I would be amiss if I did not identify less strong data. The ISM nonmanufacturing report was weaker than hoped for, throwing cold water on the notion that inventory correction is spreading more broadly into the service sector. Initial unemployment claims have backed up in recent weeks, a reminder for the still precarious state of the labor market. Auto sales slipped a notch, suggesting that the road to sustained improvement remains elusive. Finally, while retails sales posted solid gains in January, we really wouldn’t have expected much else given the decline at this time last year. Overall, while none of this data is particularly strong, I would not describe it as particularly weak, nor should it alter the perception the economy is on a sustained upward trend. As can be seen, the underlying rate of growth enjoyed a sustained surge from 4Q82 onward – an average of 5.4% growth through 1984. 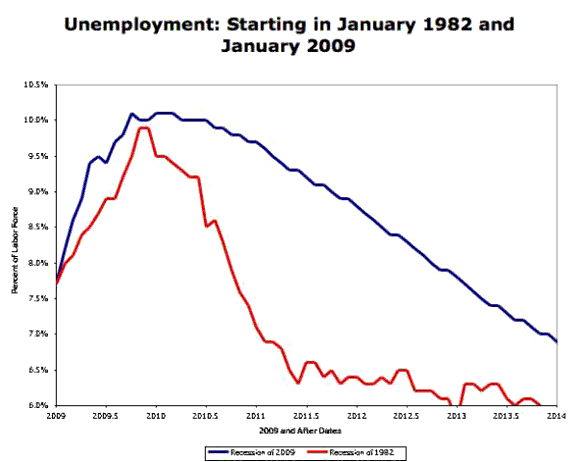 That is the kind of growth needed to drive down unemployment rates quickly. 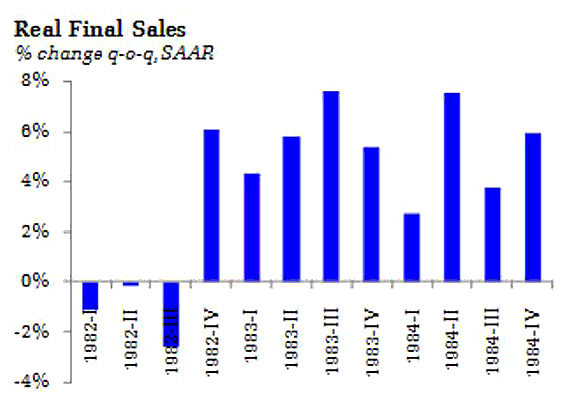 In contrast, real final sales climbed just 2.2% in 4Q09. We need to see sustained growth at more than twice that rate to bring unemployment quickly down to acceptable levels. But there is simply no faith that such a feat can be achieved. Most doubt there is sufficient pent up demand in the consumer to do the job, while Calculated Risk has repeatedly stated the case against a quick rebound in housing. With fiscal stimulus set to slow, that leaves investment and the external sector to big up the slack – neither of which packs the weight of the consumer. Consequently, the Fed can hold policy steady on the back of the current forecast, which lacks the post-1982 surge. But given the amount of cash sloshing around in the banking system, they will be sweating out the data, more concerned about the upside risk than the downside. In their defense, arguably the rapid and tepid recovery scenarios are observationally equivalent in the inventory correction phase of the recovery. Bottom Line: An expected improvement in labor markets would not be unexpected given the GDP surge at the end of 2009. But sustainability is the key, and sustainability requires 4Q09 GDP numbers in the absences of inventory effects. Few forecasts are looking for such growth, certainly not yet at the Fed. Indeed, the recent travails of the stock market and sustained sub-4% level on 10 year Treasuries argues against such growth as well. Interestingly, at this juncture, I place more weight on the upside risk than the downside, although I suspect that is a factor of my relatively low expectations than any real optimism on my part. I don’t see an actual return to recession short of another negative demand shock, but I am expecting the economy to settle into an anemic pace of growth. In this environment, I don’t see how the Fed is interested in substantially tightening policy – but I can see how some policymakers could perceive that their hand was forced if they see a string of upside surprises in growth indicators, especially if the January read on employment is better than anticipated. Still, I think only clear evidence that a 1983 recovery is emerging would prompt a sudden policy shift at the Fed. Tim Duy is the Director of Undergraduate Studies of the Department of Economics at the University of Oregon and the Director of the Oregon Economic Forum.